This week we’ve been imagining what a school might look like where students tackle the world’s problems (right now), follow their passions, and learn flexibility. These ideas are inspired by so many conversations and experiences, but here’s two of the most recent. Last week on the same day, I received a text and an email from two of my favorite people in the world who both happen to be teachers. There’s so much I could say on this topic, but for today I’ll keep it brief. The bottom line is that amazing teachers make amazing schools. Amazing empowered teachers (who avoid burn-out and stay in the classroom) solve problems, come up with awesome new ideas, and keep an amazing school amazing. So imagine a school where teachers had the time and space to continuously learn (literally learn the new skills the world demands – like how to use a 3D printer), to collaboratively problem solve, and to dream big. Imagine if those same teachers were empowered and trusted to figure out what’s best for kids – to literally sit down at the beginning of a semester, look at their kids needs and passions, and create a plan based on that. 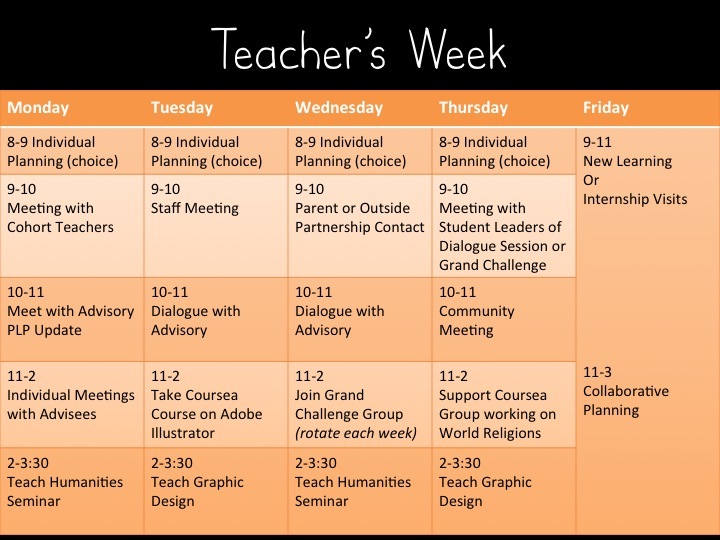 Maybe a teacher’s schedule would look something like this…. What do you think? Let us know your ideas! I wholeheartedly agree. Most of us became teachers to do exactly what you suggest. We want to be at amazing schools and we want to engage and inspire our students. I think that by letting teachers lead and carving out that much needed time to collaborate, an amazing school would indeed be created and maintained. I am ready and willing to join a teacher-led school- just say the word!